Glenn after visiting one of my Old Boats HMCS/M Onondaga, S73 in Rimouski, P.Q. I stumble upon your jewel. BZ Shipmate. Regardless of the Navy it rings clear. We were all “Diesel smelling Studs” and loved it. D.B.F. pretty good.probably the reason i dont sleep much. most ofd the good folks who rread this wont have a clue. cheers m8. Tony, take a look at my recent post about Midrats. A really beautiful rememberance of Diesel Submarines of which I served my last 13 yrs in the Royal Navy. I will never forget my Brothers in Boats. Thank you,thank you.As a retired Diesel Boat Submariner this was poingnant.I served for 23 yrs in the Royal Navy (13 in Subs) then I retired.I will NEVER forget my Brothers in Boats. Spent Saturday night on the Ling with about 20 boy scouts and leaders. This is the second overnighter I’ve done. I enjoy my time on the old boat trying to show the scouts what it like to live and work on one of these antiques. You can’t explain it you have to live it. It will be 50 years next month since I left the Sea Robin and Navy but in ways it seems like yesterday. I think about my life on the old boat every day. I have been fortunate to have been able to spend time on the Ling and Torsk and bring some of the memories back. Glenn you have captured it far better than I could how us old sewer pipe sailors feel about our old boats. You can take the submariner out of the submarine but not the submarine out of the submariner. How very awsome and the memoriesmit brings back. I rode smoke boats, SSN,S, and SSBN,S eight in all in the span of 23 1/2 years. Could I have your permission to forward this to my old shipmates and to my SUBVETS at CHARLESTON BASE. It would be very much appreciated. Glenn, absolutely. I’d especially be honored if you can forward the credits and my contact info as well. it’s always nice to see where my writing has been to. Sounds, setting in the fwd room on the Robin (USS Sea Robin 407) 1963 – 1967 on watch you know every sound. The slightest sound will get your attention. That attention may also save the boat and our shipmates. That attention to sounds is still with me today. I seem to hear things no one else hears or they don’t pay attention too. I have saved several potential house floodings and cars by paying attention to changes in sounds. Love your article, Thanks Brother of the Phin . Thank you for posting this, Glenn, I’m a retired “nuke Boat baby”, but I can certainly appreciate the perspective. For us, it was not only the faint smell of Diesel, but also of Amine. I have numerous memories of going to sea – most of which I can never relate to anyone who wasn’t there, but that’s okay. The folks who CAN relate… they’re the ones who understand the most. I wasn’t a submariner, but Dad was. He was a diesel boat man (USS TUSK), and when he can off of patrol, he smelled like the Boat, and I equated that smell with safety and security, in the arms of my biggest hero. Forty years later, I toured USS REQUIN. When I went below, I smelled that distinctive smell again, and for a brief moment, I felt my Dad’s arms around me again. God bless the old diesel boats and their crews, and those that followed in their wake. It warms my heart to be with my shipmates aboard the USS RAZORBACK SS394 for work parties and reunions. Love this!!!! Thanks for the memories put into words. You’re welcome, and to be honest, thank YOU – for commenting, but more importantly sticking with the young man. If you go to the “Submarine” category over there on the left of the screen, there are two other stories that, taken all three together, kind of tie different aspects of the experience together. “The Qualification of a Submariner” looks at the professional demands. “As long as being a submariner was what I wanted” tells about how I got to the point of choosing. Aye, brings a tear to me eye..
Shiver me timbers….You are too damned eloquent to be a bubble head. Permission to repost? You sent me back in time Harry. Thanks, Rick. Yes, the more people that see it, the better! Thanks for linking back to here. This is amazing–you’ve captured something us non-submariners will never experience, and you’ve done it in the sort of universal terms that are accessible to all. This reminds me of Browning’s poem “Ulysses,” which is very much the same theme. Oops, I goofed–that’s Tennyson’s poem…and me an English major! HA-ha…I’m telling…somebody. I don’t know who, but I WILL find someone to tell. But seriously, thanks. I’m glad the details came across well, I was worried. 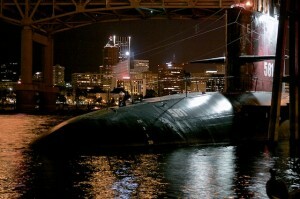 WOW, Brings back many memories of my 3 1/2 years aboard her, USS Blueback SS-581, who now lives @ OMSI in Portland, Oregon. I’ve visited her 3 times~! Your post carries the sentiment this old Phantom Phixer has about his old steeds. Give them to us for a quick turn through a Phase inspection, and they’ll be right as rain in a cuppla days. Ships seem to fare better than aircraft as they age, if they’re kept up, and I imagine a crew of old hands could make them seaworthy in no time. Great post. Thanks for rekindling the old memories. Last year I went for a week with my son on his submarine. He’s an EM, like his pop was. You’ve written about my cruise; every emotion, every sensation. It’s a nuke boat, a newer fast attack, at least for me, with a hull number almost 100 ships later than my old home. I loved being there. I fell into the old rhythms in moments. I prowled the boat on mid watch while the other riders slept. I marveled at the advances, the new technology. I rejoices in the old skills still taught in case the new magic broke. I sat at the planes again after 30 years, and the old skills, first terrifying, and later boring, came right back. And my son was the throttle man while I maintained heading and depth and angle and spat out the repeat-backs just like before. Then came breakfast at the end of the mid watch, and my son joined me at the dive, and we both relieved the planes men, and we drove the boat together. The COB and the XO and a few of the Goats watched, and shared my joy, my pride. I’ll probably never get to go again; but I didn’t expect to go on that cruise, so who knows? That is Awesome! I’d love to do that, but I guess my imagination is going to have to do. Thanks for sharing that! Love this.. what a detailed, expressive way to describe a voyage!! You really brought me up short on this. So many writers try to convey the deep feelings of taking a submarine to sea and fall way short. I lived on and knew the USS Razorback for 3 1/2 years in the early 60’s and felt the same way about her. The smells are the first this you notice, and the familiar way the passageways wind and angle through the compartments. The sounds are both constant and abrupt and you get to know each one, what they mean and how to respond. To stand on the barge now and look at her form is breathtaking – you think: “Couldn’t she just slip those cables and edge out to sea one more time”? To have my old shipmates there and sense the same as they are feeling is an unbelievable sensation. If you don’t understand that, nobody can explain it to you. You had to be there and I am thankful to have served in the DBF Navy! When I write, Ron, I try to write from my own perspective in a way that will be the same for someone else. Of course, its always hard to tell if it worked or not. Glad it worked for you, thanks for the comment.